The first phone tracker for Android smartphones, it has now become the number one phone tracker of choice for most individuals and one that is sure to keep that expensive beaut of your under more security. Where's My Droid has evolved a lot and is now a fully functional and highly customisable tracker. As expected, you will be notified of a SIM change if you have enabled it and given the number of a friend or relative. And you can define your own custom attention word so as soon as you SMS that word, the phone will start GPS tracking and will also ring with another word. 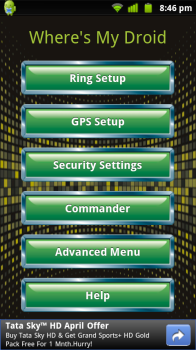 The app has an interface called Commander using which you can go to their site and manage your stolen phone's actions in real time. You can also put in a pass-code so the person who has stolen it cannot access it and make any changes to the app settings. There is a stealth mode which does the nifty thing of not showing messages with the attention phrase or word to it and hence doesn't alert the thief. All in all, its a must have app for your Droid and since its free, there is no reason who you shouldn't hand the protection duties to this fella. Not everyone is a sports buff. But if you are, then this is a life saver and the ultimate app you would ever require. Coming from the stables of the world's most popular sports network, ESPN, this app literally covers all sports. Literally! I dare you to find a sport for which you will not receive updates in this app. 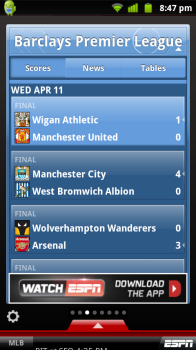 The app has personalized scoreboards and live game details featuring last play, in-game stats, box scores, game summaries and standings and includes a wonderful feature called myTeams in which you can define your favourite teams such as India and Manchester United and get their score updates in just a single page. You can add multiple sports and leagues to the pages and scroll through their updates. There is also a handy live ticker at the bottom of the app providing you with the latest updates and news. You may also choose to get notifications when your favourite teams are playing so that you won't miss even a single boundary or goal just because work has pulled you back. Stop waiting and check if that ball has gone for six already for free right now.